Gills RSD (CRPS): November- Battling on. Whole body hurts, Flu jab RSD, FIBO who knows, who cares. I am sorting out my wardrobe when the pain will let me. Putting away my Summer stuff and getting rid of some things. I know if I sit down the pain will become worse. I am more tired as I got less sleep last night though pain and spasms. Awoken in pain and spasms again!. A lot of pain in my left side of my head, more so when I lift my right foot which hurts a lot as well. Strange you think- this is RSD remember. Think of tales from the dark side or may be the stupid side. Aah well things can only get better? A better day! but not by much. Pain has lessened a bit. I am in the garden planting bulbs I put aside three tubs I needed five in the end, it will look nice in the spring. Tided up the garden a bit. Quite windy today my eyes are sore. Quite a few IBRUES and DIHYDROCODEINE taken over the last few days they help a bit. I am trying to keep off the ORAMORPH as it messes me up and my body craves more and more MORPHINE. IBS getting in on the act now probably feeling left out. My body still aches, headache also, and my knees are swollen a lot, very tender as well. Even gentle touch hurts. In fact most of my joints hurt. A bath helped a bit then bed about five am just as my neighbours were getting up for work. Morning. Pilate's went quite well a bit stiff but I managed most of the moves. Took some more IBRUES after, then home for a while then physio. Now physio is on a Wednesday after Pilate's I only have about three quarters of an hour at home just enough time to get some dinner. Physio- I have decided to give my physios names, well they already had names but I did not use them- Nicola and Stephanie, both very good and slightly crazy . The treatment was five needles in each leg three in each arm one in each hand. Three in neck and head eighteen in all. Felt far away but not dizzy with the head ones. Right foot went crazy, spasms and pain Nicola adjusted the leg one on each side this helped a lot and foot gave in. Stephanie gave my back and shoulders a massage using GUA SHA as last week. Gua sha (Chinese: 刮痧; pinyin: guā shā), meaning "scraping sha-bruises", is a traditional Chinese medical treatment in which the skin is scraped to produce light bruising. Practitioners believe gua sha releases unhealthy elements from injured areas and stimulates blood flow and healing. Gua sha is sometimes referred to as "spooning" or "coining" by English speakers, it has also been given the descriptive French name, tribo-effleurage. Painful as last time but it has helped my neck and shoulders regarding pain and spasms. My back was not as bad as the picture, as it was a very gentle session although it did not feel like it at the time. First time in ages that I have not woken with a bad headache, well slight one but much improved. Shoulders are quite sore and red. Quite a few spasms in feet and legs but I can't have it all can I? Knees very hot and swollen. I feel and look very bloated uncomfortable with it. Headache back to full force well at least I had one better day. Back hurts so does left shoulder, rash has appeared as well. Lindsay and family here so a good day. I had a bit of a fall on the stairs only a few steps, and hurt my arm. My RSD foot hurts, very sensitive, as well I think I probably pulled it when I fell. First frost of winter I think, very white and cold. I feel very tired today so I might sleep better tonight. Making teddies at night I am making these for presents so a few to do. Woke to spasms in legs and feet not the best of wake ups. I think I need bed socks on now even though sometimes my feet will get too hot and swell up and burn. Without the socks spasms, I can't win either way. RSD shows no mercy. My neck is not good a lot of pain and spasms. Rash very sore both sides of shoulders now very sensitive and sore. Spasms again on waking. Shoulders still very sore now rash on my right (RSD side) foot. I don't think this is anything to do with the GUA SHA as I have had the rash and soreness before, nerve rash so I have bean told. Pilate's went better this week but still spasms in my legs and feet but still I felt it was a better session for me. Physio- needles as usual, they are getting to know what works for me, well most of the time as the RSD will fight back. I had eight in my legs, four each side, one in each arm, four in my head, two in hand and wrists sixteen in total. My foot reacted to the leg ones straight away it was like a fierce battle going on a lot of pain and spasm. Again needles were adjusted and one taken out and the battle ended, not sure who won.. Some of the needles had like a twang affect like a guitar string others made me bit spacey. No massage today shoulders too sore. After wards I felt very cold, shaking and shuddering. I had a cup of tea at the cafe to warm me up but still felt shuddery. RSD messed up your ability to control body heat very much like a new baby. The system over reacts and you either feel too or too hot most of the time. Jamie-Lee in the hat I made for her. I am pleased with it and it fitted her nicely. Fair night short as usual. Pain wise quite good, still very sore on my shoulders. My neck seems to be more stable than it was even a little relaxed. Headache less as well. Hip pain left side going up hill and still leg spasms. But still a better day. Nice not to have a pounding headache all the time. Neck not quite as good as yesterday, headache back. I watched Children in need program. A little boy had a skin condition that left his body covered in sores and blisters very painful for him only a baby as well. He passed away at three years old if that was not bad enough for him and his poor parents, his brother had the same condition and passed two days after him. I felt like what have I got to complain about two babies lost with no life to show for it. Very Sad. Tears from me. A lot more spasms in my feet and legs specially my toes which will go into spasm at the slightest touch. Shoulders are improving skin feels very rough and tight like it has bean sandpapered. All my joints hurt today. Knees very bad swollen again, wrists also swollen but that could be sewing. The teds are coming along, quite a few to do, thirteen in all. Maybe a few more as well. The treatment I got last time at physio has helped me a lot more than previous ones. I know its getting the right balance but this can change from week to week. I know I am not an easy case. I am still very bloated and weight gain as well four pound plus in one day. Could this be water retention again? B12 today this hurt as usual. The nurse said I have water retention.I am going to try to get it right with herbs from the garden, drunk as a tea also nettles this is meant to help. Rosemary, Parsley, Dandelions and stinging nettles are the ones to help as a natural diaretic. I meant to be going straight into town after as I needed to renew passports, but forgot credit card so had to go home again, so twice as much walking. Later I collected some herbs off the garden, rosemary, parsley, sage, lemon balm and a few dandelions off the lawn. I poured boiled water over the leaves in a cafetiere and left a while then drank it quite nice. Might do some good, might not, worth a try nothing to loose. Broken night awake most of it. Very sharp frost, cold, snow is on its way. Cleaning up and sorting out greenhouse last of the tomatoes picked and plants pulled up. Green ones in a box to ripen up I hope. Pilate's -not good this week a lot of the moves were hands over head and arm and shoulder moves standing up. I struggled with most of them. Also one where you need to lay on your side, balanced on your hip. I thought I had got that one right. The way I did it Jo said would cause more harm than good. Also one on my toes was another no go it causes spasms straight way. I felt quite down about it. Jo said at least you did the rest fine. I still felt second rate. Physio- Usual pulse and tongue sticking out. Catch up on the last week. I told them both that my neck is the best it has bean, for a long time may be ever, still pain but I know that will never go completely. They were very pleased. I asked if they could help with the water retention they said they could. Next on with the treatment ten needles total in my legs, one in each arm, one in each wrist three in my head/neck. Seventeen in all no massage as back quite sore. The head ones not too painful floaty feeling. All leg ones were painful and points very tender on touching. These made me feel hot then cold. My right foot was fighting back sending it into very tight spasms and a lot of pain, again these were tweaked and the foot backed down a little but what a fight it gave as if to say, you touch me and I will fight back and it did with all its army. I was left as usual to relax with music and a heat lamp to keep me warm, as I usually go very cold. I got some TIDMAMS sea salt to help relax me in the bath as recommended by Stephine. After the treatment I always sit in reception just to make sure I am alright to go on my way. Going home I felt shaky and cold. Hopefully this session will help everything. Woke to a blinding headache it felt like my head was going to explode a lot of pressure there and if I bent down or leaned forward my head felt like it had rolled off, not a good start. Summer and I saw our first Robin of the season when on our morning walk. My friend Bev from Beeston Nottingham way is here today so that will be good. We had dinner and just talked about various things. She is a runner, walker and singer so very active. A pity she does not live closer. Had to take Six IBRUES plus six DIHYDROCODEINE to get rid of the dreaded head pain even then it did not go completely. Walked down to the train station with Bev to get her train back home. Summer came too, she was so good as there was a lot of people around because of late night opening. She got a lot of attention which she loved. I wonder if the headache could be from yesterdays physio session. Headache came back worse later. Another cold day, more frost. Lindsay and Jamie-Lee came back with Paul after shopping. I had bought Jamie-Lee a pink little duffle coat that fitted beautifully. Lindsay liked it a lot, very pretty little girl. Not too bad a day with pain just a normal dull headache, joints hurt so does my foot after all that fighting at physio Wednesday. I think I might have had a black out on the common not sure as Summer was sat looking at me and I was not too sure where I was for a few mins also I could not remember coming off the common or putting on Summers lead. So not sure. Fair start to the day just normal pain, hips a bit sore. Lindsay here with Tommy-Lee and Jamie-Lee Jay-Jay was with his Dad most of the day. Quite day with just the two of them but nice as no fighting between the boys. Jay-Jay did come in to see me later for a while then both of them went to their Dads for the night. Quite night for Lindsay then. Not a good night, awake with whole body hurting and spasms. Herbal tea seems to have helped, not as bloated and weight down a bit again. Or it could be from the physio they did. Making three Christmas cakes and more teds. Trouble is all the leaning over to cut out teds and sew them makes my shoulders hurt a lot. Hopefully the people who get them will be pleased, then I will be pleased as well. Not a good night, pain and spasms in my legs. Feet very hot and swollen right heel is very sore like a pressure sore. After Summers walk pain in hips as well. Walking, and trying to take the pressure off my heel a bit will have caused this I think. I am having Jamie-Lee for a few hours today to help Lindsay out. Just hope I can keep up with her. I found out late Sunday that I have no morphine ones left. I should have a least a strip of fourteen left. I think I must have thrown them out with the empty boxes. I looked though the recycling bin but no luck. I will have to go back to the doctors and tell him what has happened. Good- I can pick up a new prescription later tonight. I took Jamie-Lee into town she was very good and kept saying tar to everything. She had on her new coat I bought her. She look very sweet in it. We were dancing and singing as well. I think she liked being with her mad Nana. We got back and it was time for dinner. Soon after, Lindsay was back to pick her up. I told her about our day. I tried to get pictures but she would not keep still long enough. Plenty of the back of her head or ones with out her in at all. Managed to get this one just. The stillest she has bean all day. 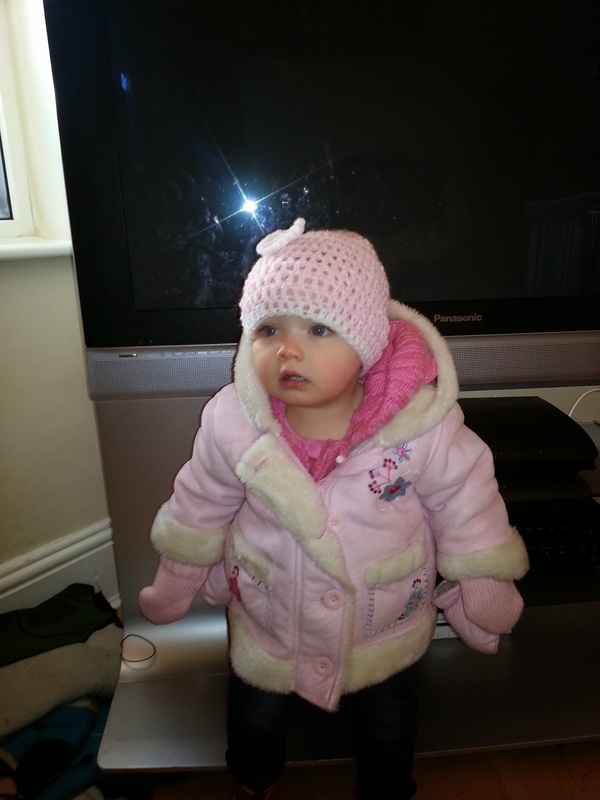 Jamie-Lee in push chair in -new coat- about to go home. I walked with Lindsay and took Summer, we had not got very far and Jamie-Lee fell asleep. As I came in the back door I did not lift my right foot up high enough and hit the frame. PAIN PAIN and more PAIN my foot went crazy. My knee hurt as well I think I twisted it. Later on my knee swelled up to twice the size. My foot is very red. The RSD was angry. Later, things got worse I lost all feeling in my leg it felt like a false one. I was worried, as that's how my foot started with RSD. I remember what Sue my first physio said put weight on the limb that has gone weird. I stood on it and held on to the chair, tears rolling down my face with the pain. I could not feel the leg just the pain. I kept doing this most of the night and early morning. I was cooking the last of my Christmas cake I made four in all so up and down to check it. Cake done- I had a bath that it was a hard job getting in to it as well. About three I decided to go to bed as very tired, pain still there even after lots of tablets. I could not get up the stairs, my right leg would not do what I asked it to do. I sat in my chair again and rested still uneasy about what was happening to me. Five am I tried to go to bed and managed it with a lot of effort. I am pleased to say my leg has regained back its memory and I can feel it again, so much relief. My knee is very swollen and tender to touch so is my foot. I think I won this round against the RSD. Thank you Sue. My trousers are very tight on that leg. My walk with Summer was better than I thought it would be quite a lot of pain. I decided to go to Pilate's even if I could not do much, hope a few stretches will loosen things up. I know Jo will help me. I think one word describes the session PAIN. At least I did a bit and I think it helped the pain. I am at physio- so please help me- I know they will. I told them about my trip with the back door. This week ten needles in legs, RSD did not fight as much as last week probably worn out from last night. Four in arms and six in my head. Just about all these hurt some made me feel very spaced and others made waves. My eyes felt weird as well. At one point I got very hot, sick feeling and started sweating a lot Stephanie put the fan on and I cooled down. Funny, usually I go very cold and shudder. After the session I felt a lot better also I did not feel cold even going home. The good feeling lasted all night. No waking to spasms today. I feel very tired but I often do after a tough session of physio. Cleaning upstairs today. My leg keeps going into spasm when weight put on it. Pain in back and under my bum. This hopefully will wear off. My foot is a blue colour and very cold in parts but warm in others. Back to normal then! I don't think its very happy. Very tender around the knee. On Summer's afternoon walk my knee kept giving way. Even so a lot better day. Teds are coming along so soon be a picture of them. Made another little hat for a little friend. Not too bad nights sleep awake a few times with spasms and pain in my right leg and foot. I am in town today getting a few presents and just general shopping. I walked there and back with too much shopping and made my shoulders hurt a lot. My foot spasmed up in my shoe not a happy sole. As soon as I took off my shoe it twisted and turned very hot and angry. Painful with a capital P.
The intention was to come back by bus but I had to pick up some thing on the way back. Any way with all the road works and rail crossing hold up it takes ages on the bus. The vibrations from the bus are usually quite bad. Summer and ginge cat are still best friends and Summer waits for him in the garden. He likes to come in for a while and have a cuddle and a bit of attention, but you have to watch him as he hides so he does not have to go out again. Summer trying to give him a kiss. Not a good night . Overdid it with yesterdays shopping and too much walking. I hurt in most places hope this will ease as the day goes on. Pressure in the head as well pain around left eye socket. Neck shooting pain again. Spasms everywhere. Oh the joys of RSD where else can you get a full body work out just with pain and spasms. One of those belts that sends pulses may be? Lindsay and the gang are here so not much peace today. Jay-Jay happy to be with Nan. Jamie-Lee in her new coat but she did not want to keep still. I took a picture of just the coat- easier! No don't take my picture. Okay then. Smart hat Tommy-Lee. Jay-Jay on Jamie-Lee's little car- he got stuck. He said he has now got a wheel instead of a willey. We managed to separate Jay-Jay from the car. I took my eyes off her one minute. This is what happened, all the DVDs off the bottom shelf. No more pictures for now. Jay-Jay looking through the window. As you can see not the best of months but not the worst either. My treatment at the physio is about spot on now so as long as I can keep going things will improve even more. Over a year now, so they are getting to know me and the RSD. Hopefully this will not be upset by the Christmas break. Hope you are all well and looking forward to Christmas Love Gill.